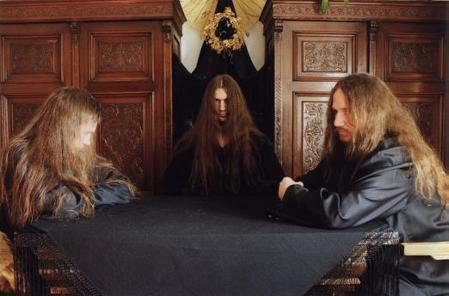 By now, most of the international metal scene is at least familiar with the name Negura Bunget. But for those unfamiliar, and for those seeking additional information, summarize the history of the band for us. Grounded on the early '95 as duo (Hupogrammos Disciple's - guitars/vocals/keyboards and B.P.P. - drums) Negura Bunget released its first demo - From transilvanian forests - at the end of '95 (still available for 5$). 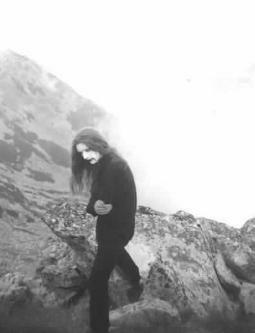 At the end of '96 Negura Bunget released through Bestial Records the first LP- Zirnindu-sa - 8 tracks of pure transilvanian black metal... sold by now more than 2500 copies (available for 8$). A CD version (re-mixed and re-mastered) of Zirnindu-sa was released in October '98 by Breath of Night Rec. U.S.A. (available for 14$). In December '98 we released a new 4 track MLP - Sala Molksa - transilvanian spirituality's music (available for 7$). (Also available a Sala Molksa black-color T-shirt/LS for 13$/16$). Bestial Rec. released the CD version of "Sala molksa" in May '99 (available for 10$). A 7" version from "Sala molksa" should also be released in the near future by Sombre Rec. Germany. The actual line-up features Hupogrammos Disciple's on guitars/vocals/bass/keyboards, Negru (B.P.P.) on drums/percussion and Spurcatu on guitars/vocals. I'm not also so sure at all about our international familiarity. Your newest release, a mini-CD entitled "Sala Molksa," could you tell us about this release in your own words. How does it differ from your first CD? What does the title mean? Well, we see this MCD more like a preparation for our next album, to be released hopefully before the end of the year. It is different from our first CD but not as much as the new one should be (and I don't mean here precisely in the musical area, but more like the whole concept). We also have here even our one and only English lyric, "Sala molksa - Channeling through art immortal", presenting in a general symbolical manner the most important characteristics of our ancient dacic spirituality and its remains in the Romanian folklore. These elements form what we see as Transilvanian Spirituality. This is the base of our whole Black Metal involvement! "Sala molksa" is actually a very complex word/place/concept in close connection with our ancestors' high spiritual value: the immortality. This way Sala molksa is the concept place where the braves went after their glorious death. But the word came directly from the Indo-European language and because of that it is actually inconceivable for a modern mind to even think such a concept. Could you tell us about the topics of your lyrics? What sort of topics do you deal with? There are a lot of anti-religious sentiments in the music scene today. Where do you stand on this topic? I wouldn't say there is such a high level of anti-religious feelings as there is of anti-Christianity. There is a difference. I would say we are more like for an a-Christianity approach rather than an anti-Christianity one. Indifference is the key of the real power! Cause if you really hate something, it also takes control over you! And I feel it is much easier to defeat Christianity with knowledge and intelligence rather than big words and extreme feelings. As for religion in general I think all should be considered from case to case in particular! Nevertheless, religion is a very powerful and important component of the human's spiritual life. And although I prefer to say I'm stronger than needing something of a high "controversial" nature, I think I'm also wiser than saying religion is surpassed in these times (or in any time). Consequently, I feel everybody should explore their inner self in order to reach the deepness and really understand its needs. But for most of the cases this process should mean if fact only: Read, read, read!!! So, I don't think a general anti-religious feeling is a wise solution. 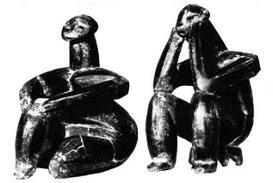 Could you enlighten us on the ancient Gods/Goddesses of ancient Romania? How do you feel about them? There is a very complex and difficult situation regarding all the elements of the ancient Romanian history (prior to the Roman coquets from 106). This is also the period we are more focused on, as we see it to be the very cradle of all later developments. There are two separate periods worthy of mentioning: the ancient dacic history, with its outstanding spiritual system focused around the figure of Zalmoxis and the pre-historical period, of the Pre-Indo-European times and the process of Indo-Europeanisation. Passing to the more 'recent' times (only about 2500 years ago), we can find around these lands the Dachs, Romanian nation's oldest direct ancestors. The Dachs were among the Tracic tribes (located on all Balcanic Peninsula). Ancient Greek historic Herodot said: "The Trachs are the second large population of the earth after the Indians, but are separated in many tribes". "The Dachs are the most brave and cruel among all the Tracic tribes". 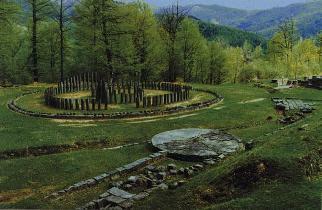 Located in the geographical masterminded 'arranged' fortress in the Orastiei Mountains (SV of Romania), around the heart of Dacia - the spiritual capital of Sarmizegetusa Regia, the Dachs developed an amazing culture under great leadership such as Burebista or Decebal. The Dacic spirituality and religion was quite apart for their time, praising immortality, bravery, strength. They always preferred to die instead of suffering any humiliation (even their leader Decebal committed a ceremonial suicide in front of the Roman coquets). Their high spiritual figure was Zalmoxis, but due to the high level of mystery surrounding the dacic religion as well as due to the total destruction of all religious dacic monuments after the Roman conquest (totally apart from the usual roman politics concerning the religion of all other coquetted nation, which often even imposed their gods in front of the official roman ones, but very motivated in this case as the center of dacic religion was freedom and independence) we know very little about it. Yet, the Dachs performed rituals of voluntary human sacrifices in top of the mountains. And it was the highest honor to be chosen as messenger to Zalmoxis (chthonic or uranian, God of sky or of the earth.). But he could choose not to accept such a messenger, if he had an unworthy spiritual structure. So, it wasn't enough to voluntarily offer your life, you also had to have a spiritual appropriate personality. 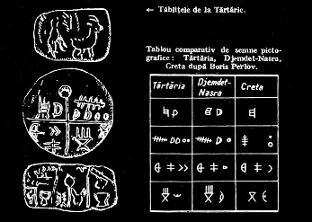 Remains of all these ancient spiritual contents (on immanence as we'd like to see them) are still present under hidden 'clothes' in the contemporaneous Romanian folklore, forming together what we like to call: Transilvanian Spirituality, which is also the base of our Black Metal involvement. Our Black Metal involvement is by that also a continuing process of auto-researching ourselves, as well as exploring our transcendental national patterns of behavior and understanding. Not many people in North America are very familiar with the Romania scene, including myself. So what other bands could you recommend from Romania these days? Is the scene very strong there? I couldn't say there is a really important Romanian scene. There are a few interesting good bands, some shows, Magazines.. I also couldn't say there are any Black Metal bands worth mentioning around here. 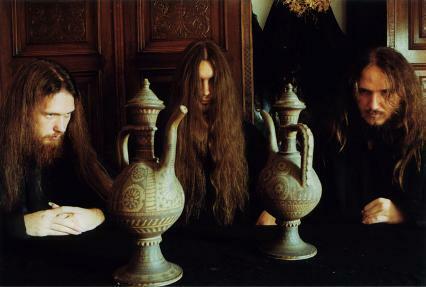 But there are some interesting dark/death/doom/gothic ones such as: Grimegod, Thy Veils, Makrothumia. What do you wish your listeners to feel when they hear your music? Is there certain feelings you try to invoke? Actually, I think our name itself properly offers such a description. Negura Bunget is the way a black fog comes from a deep, dark, dense transilvanian forest- and I think this pictures both the musical and spiritual atmosphere we'd like to create through our Black Metal involvement. Most of the bands we interview share our feelings on the decline of the world. People are growing tired of the bleak future that is unfolding internationally... do you foresee a darker future for mankind? I think such an evolution is a very striking situation. I would say there has been quite a long time of spiritual involution for the whole of mankind. As for the bleak future. I'm not so sure. It is not at all that I see a purple future ahead us, but even this perspective we have over the greater past is something we gained only as a consequence of the involution. If there is one thing you would miss, hypothetically, once you are dead-regarding being alive, what would it be? And the opposite, what would be an aspect of life you'd be glad was over? I would never consider that my knowledge regarding the afterdeath could allow me to have even a poor description of what there really is. Therefore, I cannot possible say what I would miss being dead. As for the opposite, I think I'll feel good even for the actual fact that my life has passed (but this is also something I could appreciate better only after experiencing it). When you contemplate death, what do you envision... do you see a possibility of a part of us living on, or is this just a human hope derived from a fear of death? Rationally I would have to say it seems totally impossible for me to envision another world in which all the imbeciles of this one (from now or from all the times) can live. But above this first perception there is a much more complex one in which I always consider such preoccupation to enter a level of mystery that can only be destroyed by thinking of it or reasoning it with our poor intellects. What would you say the old world possessed that this modern world lacks? There are so many things missing is this actual world. It is even hard for me to choose a field to start with. But, to begin with something I'll say I always enjoyed the perspective traditional societies had over their every action, which gained its importance only if it was circumscribed into a larger horizon, surpassing the human concrete limits. Following the right steps your actions really gained significance. I always appreciated the Romanian traditional mentality also (to which I'm myself more familiar with, but which is common to many nations) in which the pass of times was in close connection with the actual moods of nature, with a higher spiritual time in which the actual one should be integrated. All kinds of fascinating ceremonies followed the end of the year (the most critical times, symbolically remembering the primordial chaos from which the time was born), the pass to a new season, the moods of animal (around here by the 19th century were still held more than 40 days for the wolves, including in its time of copulation very strict ceremonies). And, I could go on and on, mostly with small fact, but which, put together build a totally different reality, which totally lacks in the present! Is there a particular age you would have rather been born? If so, could you explain why? I think it is a very tricky question, to one there isn't a proper answer. We see all the history with our mind and way of thinking from now, gathering by that a very personal subjective answer on how ancient times were. But the minds of the ancients were fundamentally different from ours. That's the most important thing to be counted when answering such a question. And with that in mind I think I would like to experience the world and spirituality of our brave Dacic ancestors (~2100 years ago). But I cannot honestly say I would rather been born then. I like the perspective I can gather from my time over those glorious times. If you could learn the answer to any one question, what would the question be? I would only like to have such an opportunity, to be in the actual place from where I could find anything, and then no question would be further relevant! Lastly, tell us what we can expect for the future of Negura Bunget. Any tours planned etc.? Have you done any shows lately? How is the turn-out? Well, we are really working on our new album, to be released hopefully before the end of the year. And as we spent more than 2 years arranging all the details, I think this time it should really be something special. We've already done more than 30 gigs around here. We see a proper Black Metal Live Act as the total outburst of power so we always prepare very carefully every details of such an appearance. We should play a few gigs in the near future. As for a tour plan, unfortunately I don't think it shall happen in the near future, and not because we wouldn't like it! Stay Black. and may the ZSALAMOLKXISA be your way!